In this exercise students choose a phrase that triggers or doesn't trigger the present subjunctive and then combine it with a sentence that has to do with Halloween (La Noche de las Brujas). Students must change the indicative to the subjunctive when this is necessary. Students can work in groups. They can write down their answers or simply say them. The instructor can walk around the room, listen as each student produces a sentence and hand out a pumpkin sticker or image for each sentence a student makes. The student with the most pumpkins at the end wins. 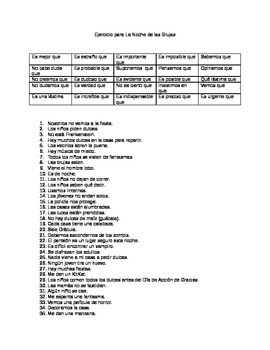 There are over 25 subjunctive triggers/non-triggers and 40 sentences to combine them with. Possible sentences: Es posible que los niños se espanten. Es indispensable que haya muchos dulces en la casa para repartir. Sabemos que es difícil encontrar un vampiro.